Life is becoming more like The Jetsons all the time, especially around the airport. In a recent article, Travel Weekly told us about self-bag drop at some airports using machines by German vendor Materna. While tighter security regulations have prevented unassisted self-bag drop machines in airports, U.S. airlines and airports are finally exploring the possibility of a rollout. According to Stu Williams, Senior Vice President for Special Projects at the Denver Airport, nearly 200 Materna machines are being installed as part of a broader overhaul of the airport’s central Jeppesen Terminal. This means that by 2020 every bag drop location at the airport will enable flyers to self-check their baggage. 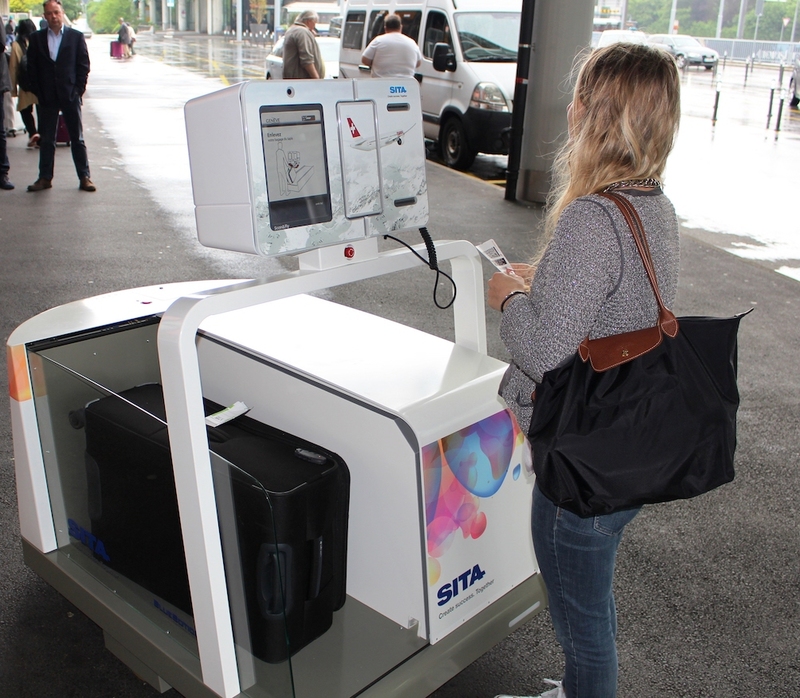 According to a study by SITA, another vendor of self-bag drop machines, 45% of airlines offer unassisted bag drop around the world. Passenger identity is typically agent-verified prior to accessing the bag drop machines for security purposes. The machines can be time-savers, too. Once at the machines, passengers drop and weigh their bags, scan their bag tags and boarding passes, then they leave their bags to be routed to their flight, all without further agent contact. Some machines can accept payment for oversized baggage, and others offer biometric identity capabilities. Then the machine rolls to the baggage handlers who route it to the correct plane. In addition to saving time, the machines provide substantial cost savings as agents can monitor up to 14 machines. But in the U.S., the TSA requires an agent manually verify passenger identification. The TSA has also pledged to speed up biometric development and released a road map for biometric expansion. 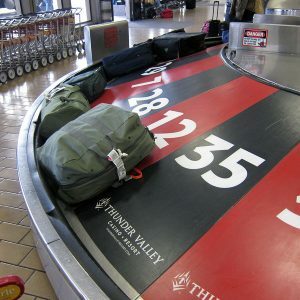 Several airlines like American, Alaska, Delta, and United, and airports in Minneapolis-St. Paul, Los Angeles, Atlanta, and Miami have begun using self-bag check as well. Meanwhile, at New York’s JFK Airport, JetBlue will begin testing biometric self-bag drop this month. Will you use self-bag drop or are you a carry-on purist? Do you trust the technology to get your bag to your destination on time or do you want to hand it to a human being? Share your thoughts (or experiences) with us on our Facebook page, or on our Twitter stream. If you don’t know how to pack light, be prepared to pay for the privilege of checking the luggage you need to accommodate your clothes and other essentials. According to a recent CNBC story, travelers paid $4.6 billion in checked bag fees in 2017 alone. In other words, if you wanted to take a large suitcase, or even check a smaller carry-on, it could cost you anywhere from $50 or $60 for your first bag, and $100 for a second. Packing one outfit for every single day. This is especially bulky if you’re going to be gone for more than five days. Solution: wear certain items more than once. Packing things “just in case,” like a dressier outfit in case you go to a nice restaurant. Solution: Confirm your dinner plans before you leave to ensure whether you will or not. Packing individual, complete outfits. Solution: Pack mix-and-match outfits. If you’re traveling for four days, take two pairs of pants that go with each of the four shirts. Packing every comfort of home, like pillows or full bottles of shampoo. Solution: They have pillows at your destination. Also, buy your shampoo or other lotions, etc. when you arrive. I guarantee they don’t cost $100. One way around the checked bag fee is to upgrade to an Economy Plus ticket, from the basic economy. Or use a credit card that gives you one free checked bag as one of your perks. the length of the trip. You may not be headed out on the road for two weeks, but if your travel plans take you away from home for business or leisure this summer, scrutinize your clothing and luggage choices so you don’t waste money on unnecessary baggage fees. How do you avoid baggage fees when you travel? What are your packing tips? Share them with us on our Facebook page, or on our Twitter stream. If you’re attached to your laptop with an emotional umbilical cord, you may need to plan how you’re going to survive the separation that may be forced upon us all if the Department of Homeland Security’s current laptop ban is broadened to include more U.S. bound flights from more Middle East and European countries. In March, the U.S. banned laptops on flights to the U.S. from 10 airports in eight countries, including Egypt, Saudi Arabia, Kuwait, Qatar and Turkey to prevent bombs from being taken aboard flights inside laptop computers. They nearly expanded it to all U.S.-bound flights, but have instead created some additional security screen protocols instead. We’ve reported here before about the increased use of RFID chips in checked luggage and luggage tags to tilt the odds that your bag will arrive with you at your final destination in your favor. There have been new innovations in the effort to reduce lost bags, this time from Delta. Once you see what they’ve been doing, you may never look at those little paper baggage tags the same again. This year, Delta has implemented RFID technology into its complimentary baggage tags, eliminating the possibility of a bag being unscanned due to a smudged, wrinkled, torn, or obscured tag. Now, in every airport where Delta operates, its bags only need to be be in proximity to the radio scanners to be accounted for. As with the older tags, fliers can track their checked bags using Delta’s mobile app. Implementing these kinds of changes can be costly and disruptive because they require infrastructure adjustments. While some airports, such as Las Vegas’ McCarren International Airport, have been using RFID for over a decade, any new tracking system is typically the responsibility of the individual airline. Delta spent $50 million on the system, which included scanners, printers, and said tags. 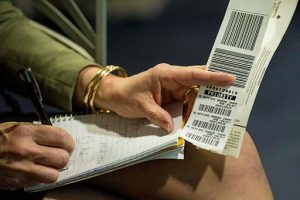 Widespread use of these types of tags has been slow to come online in the airline industry, according to the International Air Travel Association. But the deadline for all 265 member airlines to be able to fully track and trace all bags is 2018. And the system is expected to work, not only on an airline’s own flights, but also connecting flights with another carrier. It can happen when you least expect it or you can discover it when you’re retrieving it from the baggage carousel, but no matter how it happens, a broken suitcase has the potential to severely impact your travel experience. With a little bit of resourcefulness, you can get through your trip and back home. Here are some ways to address common problems, as well as some Travelpro® product features specially designed to help avoid on-the-road luggage disasters. 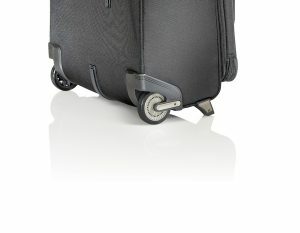 If your suitcase wheels stick, check to see if anything is stuck in the housing. If your telescoping handle sticks, apply a small amount of lubricant to literally grease the skids. See if you can track down some WD-40; if that’s not available, a little soap can help. If the handle is slightly bent, you may try manipulating it back into proper position. If it’s clearly broken, at least you have the other handles to carry the bag. An add-a-bag attachment strap, such as Travelpro® offers on many of its rolling products, would allow you to hook your broken bag onto another until you can address the issue. If your wheels aren’t rolling smoothly, chances are there’s something stuck in them that’s inhibiting their movement. Wipe them with a damp cloth and look for anything that might be stuck in the wheel housing. If the wheels are wobbly, causing the bag not to pull straight behind you, the screws could be loose. Tighten them up – if you don’t have a screwdriver handy, call down to the front desk and ask for one. Travelpro designs its wheel systems with the frequent traveler in mind, subjecting their products to miles of rigorous testing. Our patented MagnaTrac™ Spinner wheels are self-aligning and have a specially designed housings to protect them from damage on baggage ramps and as they’re pulled over curbs and through terminals. It’s the last thing you want to have happen when you’re traveling: your bag doesn’t show up at the baggage carousel. It has an immediate impact on your psyche, not to mention your itinerary. 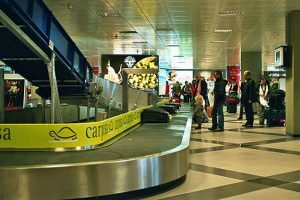 But if the airline loses or mishandles your bag, there are a few steps you can and should take before you ever leave the airport, and a couple steps to take before you ever even get there. 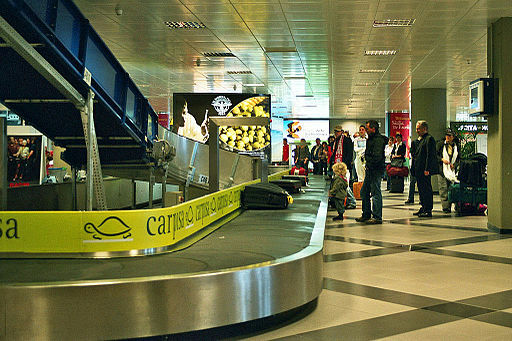 The Palermo (Italy) Airport baggage claim. Next, before you ever get to the airport, pack your essentials in your carry-on: your medication, laptop, papers for your presentation, and anything else you can’t afford to be without. I once read a story that involved a woman whose lost bag included her laptop with a sales presentation she was to give the next day. She got her bag back in time, but we couldn’t help wonder, why would you ever relinquish control of the most important part of your trip? Even with his vivid imagination, Leonardo Da Vinci, recognized for inventing the world’s first robot, could never have envisioned this application for his creation. Or that it would be used in coordination with another of his inventions, the flying machine. Yet here we are, as Geneva Airport has been trying the world’s first fully autonomous, self-propelling baggage robot to assist travelers with their luggage. Working in collaboration with Swiss telecommunications company SITA and BlueBotics, a robotics company specializing in Autonomous Navigation Technology (ANT), the company has named their robot “Leo,” after the famed Italian inventor and artist. 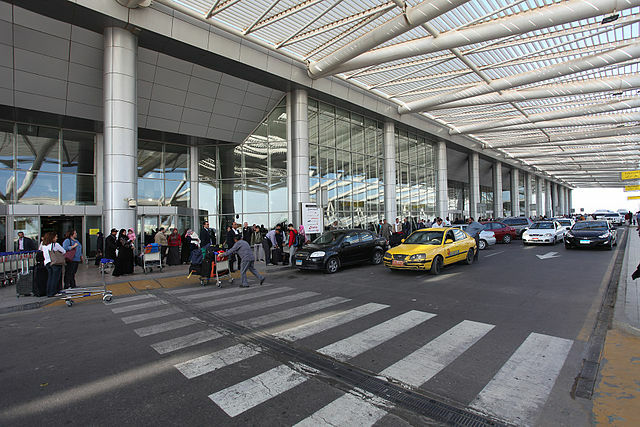 Leo can check in luggage, print baggage tags, and transport the luggage to its designated baggage handling area using information gathered by scanning passengers’ boarding passes. After the bags are loaded into the robot’s compartment, Leo displays the boarding gate and departure time to the travelers. No one other than a baggage handler can reopen the compartment once it departs for its designated destination. While some kinks remain to be worked out, such as scalability of the entire system, the capacity, both in size and weight that the robot can carry, and how it navigates in snowy conditions, this trial at Geneva’s airport makes it clear that ANT robotic assistance is here to stay. What do you think? Would you trust a luggage-carrying robot with your bag? Or would you prefer to check your bag yourself? Share your thoughts in the comments below, on our Facebook page, or in our Twitter stream. Is Curbside Check-in the Best Perk You’re Not Using? For some people, curbside check-in is a relic of the past that has somehow been overlooked in airport modernization. 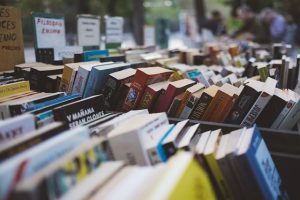 However, those of us in the know realize that the convenience and service make it the best little-known perk many travelers aren’t taking advantage of! For example, when I check my Crew 11 25-inch Spinner, I thoroughly enjoy the full-service process. There’s rarely a line deeper than one or two people, the skycaps are always helpful, all I have to do is present my driver’s license and credit card, and in seconds my boarding pass and bag tag are printed and I’m on my way straight to the security checkpoint. The service can also be used to check bags that have already been accounted for during the online check-in process. Either way, the inside check-in lines are almost always longer, increasing the amount of time it will take you to get through security and to your gate. The demographic of those who utilize the convenience of curbside check-in falls into roughly three categories. 1) People traveling with small children may have carseats and strollers as well as luggage, so curbside allows them to offload all but the essentials for the trek to the gate. 2) People who are in a hurry use curbside as a way to minimize wait times, especially if they’re running late. And 3) people with mobility issues find that only having to maneuver their bags from the car to the skycap — who most likely will help with their bags, if asked — is the best way to navigate the airport. Using “lightweight” and “durability” in the same sentence when describing luggage may seem like an oxymoron. Duffel bags have long been lightweight; heavier hardshell case bags have been durable. And that’s the way it has always been. 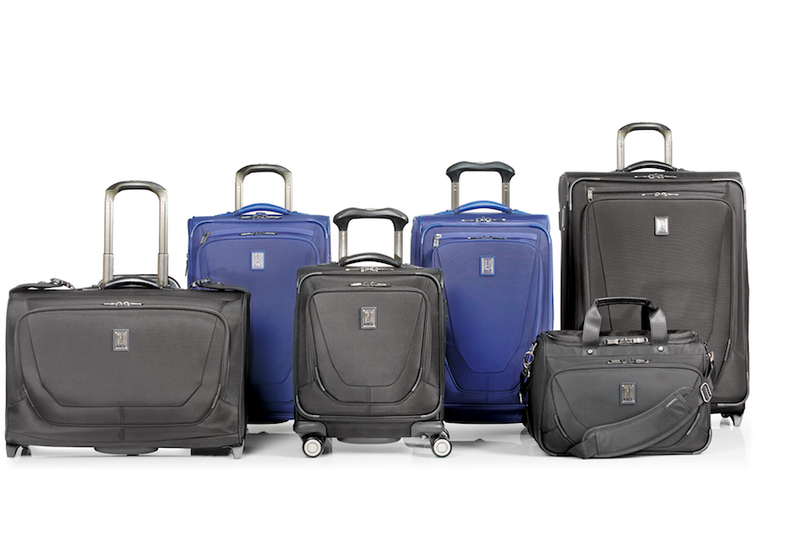 When it comes to “lightweight durability,” at Travelpro®, we have built our reputation on marrying the two. It’s simple science: The lighter the bag, the more you can put into the bag to meet the maximum allowable rate. With airlines instituting weight limits for checked baggage, and carry-ons for international travel, the empty weight of luggage matters. It all starts with the lightweight frame, which has been subjected to (and exceeded) rigorous testing criteria. And while all of our collections have new design innovations, let’s focus on Crew™ 11, the sister collection to our FlightCrew™ 5 collection, which is used extensively by flight professionals.